What is a skin? It’s the part of your avatar that makes you look like a real person. And Oh my! Hold on to your hats! These are some amazing skins. You’ll be hard pressed to find anything like them in Second Life. They are real as real can be. Really. And something more . . . they are magical! The skins are the result of months of painstaking work using a technique which involves a series of specially lighted photographs overlaid as a texture on the surface of the avatar. The result is a realistic skin that is stunning in appearance. Did we say stunning? Oh my. Are they ever! And they come in nearly every skin tone that you would find in real life – over 27 skin tones! 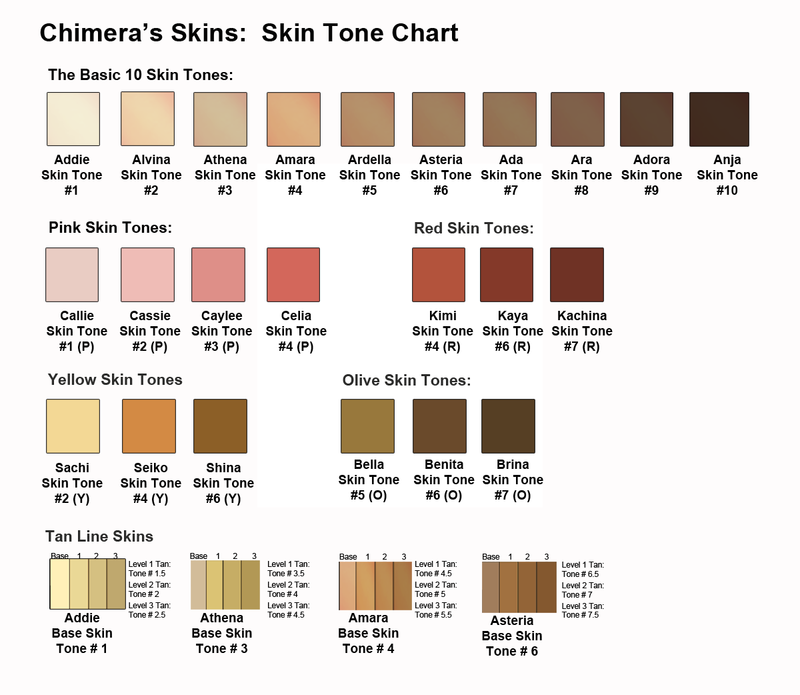 Below I’ve included a skin tone chart showing all the skin tones available. Best of all, for a limited time, all skins are on sale! My newest skin collection are “super packages”! They include 65 skins, dozens of make-up choices, eye colors galore and more. Currently I have two super packages: Amara and Asteria (indicated in red below), but I will be adding more in the future. All of my skins – all 27 of them – include 4 different pubic hair styles. Yes. Yes. I know. We’re talking about the nether regions here, but it’s just a natural part of our bodies. Believe me. In those private times in Second Life, it’s just reassuring to look – and, yes, feel – like a natural woman. The styles included are full, bikini, landing strip and shaved. All of my skins include at least 10 make-up styles. Some of the make-up styles are incorporated right on the skin (for convenience), and others include a make-up kit. I always include one natural skin with no make-up so you can wear use other make-up packages or just go au naturel. All of the skins include 12 eye colors ranging from baby blues to a stunning brown. All of the skins include 10 modifiable shapes from small to classic proportions to athletic to big and beautiful. I’ll start out with some the popular skins, and then a bit farther down, I’ll provides links to all . . . This package includes 65 skins! Amara has a gorgeous warm and golden tone. This is a “Super Package” and you get 30 different eye colors, 3 blushes, 15 lipstick choices, 4 eyelashes, 5 eyebrows, 11 shapes and 4 pubic hair styles. And it’s on sale! Athena has a slightly fairer skin tone than Amara, and like Amara, the package includes 30 skins, 4 pubic hair styles, 10 make-up styles (including au naturel), 12 eye colors, eyelashes and more. It’s on sale as well! If you really like a fair skin, then you’ll like Addie. She is our lightest skin tone, the lightest you can get in Second Life. The package includes 30 skins, 4 pubic hair styles, 10 make-up styles (including au naturel), 12 eye colors, eyelashes and more. On sale too! This is a warmer skin tone than Amara. Like all the packages described above, you get 30 skins, 4 pubic hair styles, 10 make-up styles (including au naturel), 12 eye colors, eyelashes and more. And you can’t beat the sale price! This package includes 65 skins! Asteria has a lovely light brown skin tone. This is a “Super Package” and you get 30 different eye colors, 3 blushes, 15 lipstick choices, 4 eyelashes, 5 eyebrows, 11 shapes and 4 pubic hair styles. And it’s on sale! Ada is the beginning of the brown skin tones. This is lovely brown: a very deep warm with a touch of gold. The package includes get 30 skins, 4 pubic hair styles, 10 make-up styles (including au naturel), 12 eye colors, eyelashes and more. And, yes, it’s on sale! I have 4 different skins with tan lines – the perfect way to enjoy the Second Life beach scene. If sweet and pink is your style, then you’ll enjoy the 4 different skins that I have created with pink skin tones. These 3 skins have a rich, radiant red tone. They are very earthy, very proud, very, very lovely. These 3 beautiful skins are touched with a delicate yellow tone. These 3 skins, tinted with the olive color of the goddesses, are remarkable in their grace and elegance. 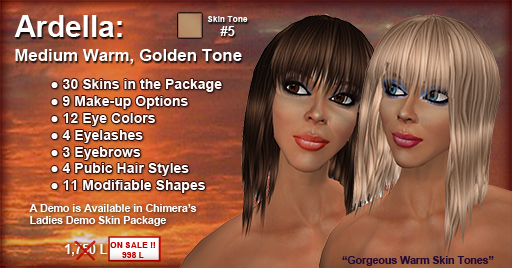 You are also very welcome to visit Chimera’s store in Second Life. All the skins, above, are available as demos. If you’ve joined Second Life (it’s free), you can reach Chimera’s store by clicking on this link: Chimera’s Simple Elegance.